Mindfulness for the Absolute Beginner consists of two different 20 minute guided sessions, suitable for those wishing to discover and develop mindfulness and enjoy the many benefits it brings. The first session is followed whilst lying down and the second whilst seated. Mindfulness is easy to learn. It involves paying complete attention to what you are doing at any moment in time without passing judgment. It's something we are all capable of doing. With just a little practice, it is possible to develop the ability to not be distracted by your thoughts and maintain 100% focus on what you are doing. 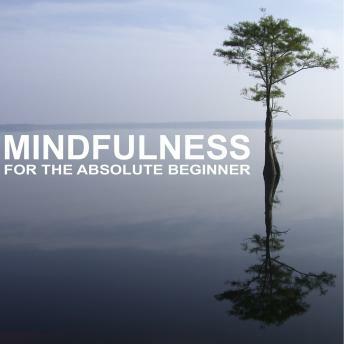 The Mindfulness for the Absolute Beginner sessions are devised and instructed by Sue Fuller. Sue is the resident yoga expert for Natural Health Magazine, a leading yoga teacher, writer and training course author who has studied and practiced yoga, meditation and mindfulness since 1995. Yoga and mindfulness are closely related. During yoga the body is moved mindfully thoughts, feelings and sensations come and go whilst complete attention remains with the current moment in time. Sue has developed a method of clearly instructing specifically for audio classes and recorded this session in a professional recording studio. The Mindfulness for the Absolute Beginner sessions are accompanied by a free PDF guide book that provides background information and reference photos for each posture used in the sessions.